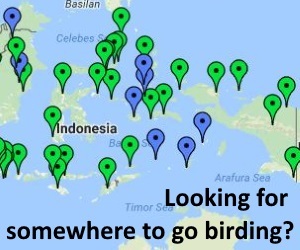 Birding in Java and Bali is many people’s introduction to Indonesian birds. The sites listed here include the best for the die-hard searcher of Java’s montane and lowland endemics, to those suited to a few hours break from a Bali beach holiday. Browse sites from the map or the table. Each site page will show links to birding trip reports, guides and other content that is relevant. Help us keep this information up to date by posting your experiences back here as comments. If you think you could write the entry for a site, or you want to add a new site, just email us and we will tell you how. Muara Angke Surprisingly good birding for the middle of Jakarta! Worth a morning just for Sunda Coucal. Muara Gembong A vast area of rice and fish ponds. Great for waterbirds, munias, Sunda Coucal and maybe Javan Lapwing?? Pamanukan Coastal mangrove, fish ponds and rice. A good site for Javan White-eye, Javan Plover and munias. Pulau Rambut A boat trip out to the waterbird breeding colony, usually passing many Christmas Island Frigatebirds on the way. Pulau Dua Coastal mangrove and fish ponds. Can be good for waders and occasionally Javan White-eye. Ujong Kulon Pristine lowland forest, but hard to access. Home to the last Javan Rhino. Carita A small patch of degraded forest that is surprisingly good for some of the lowland forest Javan endemics. Gede Pangrango THE spot for Javan montane endemics. Spend a few days exploring the different altitudes. Tangkuban Perahu Easy birding for some of the high mountain specialities. Halimun Salak Lots of forest at mid to high elevations. Some good site options for some of the mid-altitude birds that are hard elsewhere. Coastal Surabaya Waterbirds and migrant waders on the coast around Surabaya. 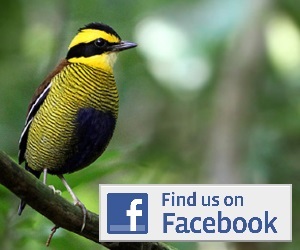 Gunung Ijen Easy East Java montane birding and a necessary trip to see the partridge and bush warbler! Lumajang Waterbirds and migrant waders on south coast of East Java. Around Jogjakarta Youve heard of the famous temples, but did you know that Java Sparrow nest on one of them? Pelabuhan Ratu On the south coast of west Java this little visited site has many of the lowland Javan specialities for those who like to explore. Sanur Good migrant wader action in season, this site has also turned up several Indonesian vagrant rarities. Pulau Serangan The best spot for migrant waders on Bali. Always worth a look for Indonesian rarities. Around Kuta More famous for its bars and beaches, its also not a bad spot to find Java Sparrow! Bali Barat The home of the Bali Starling, this park also hosts a good selection of other sundaic lowland species. Bedugul Birding in the hills of central Bali. A good range of species can be found here, including one or two things that are not so easy elsewhere.